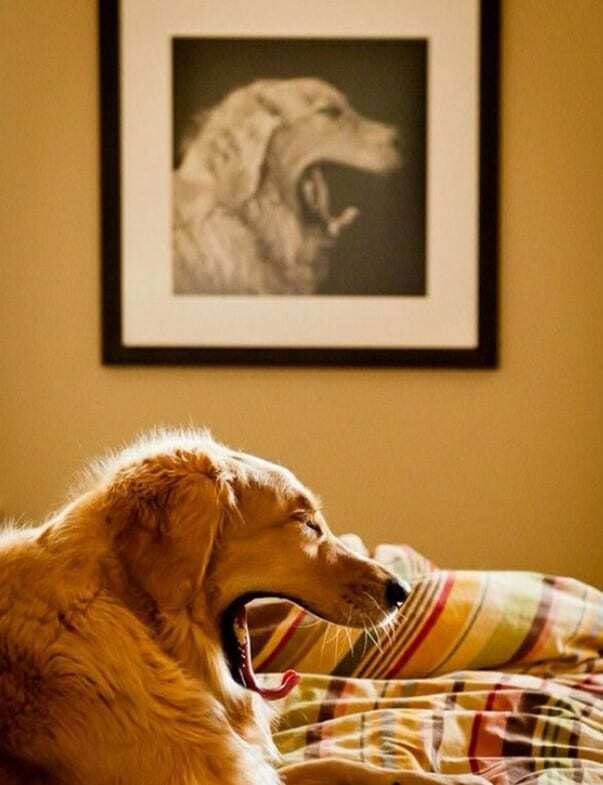 HomeInstant70 Epic Perfectly Timed Photos! 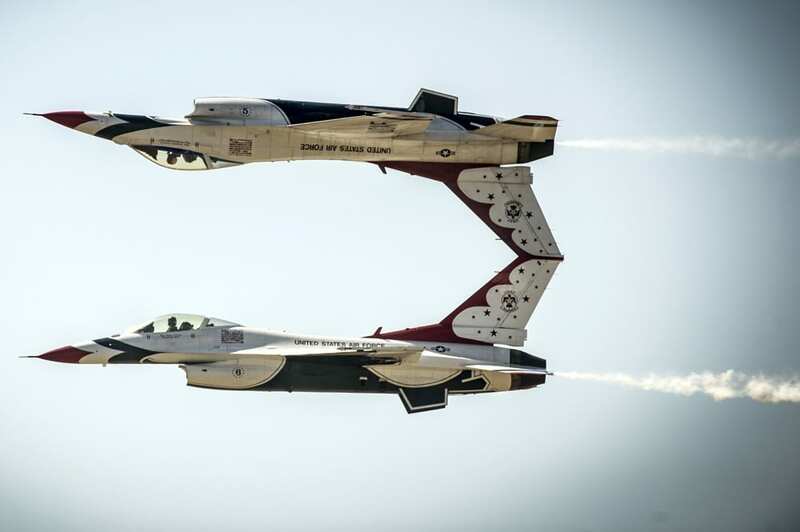 70 Epic Perfectly Timed Photos! Now that is what we would call one big stretch. 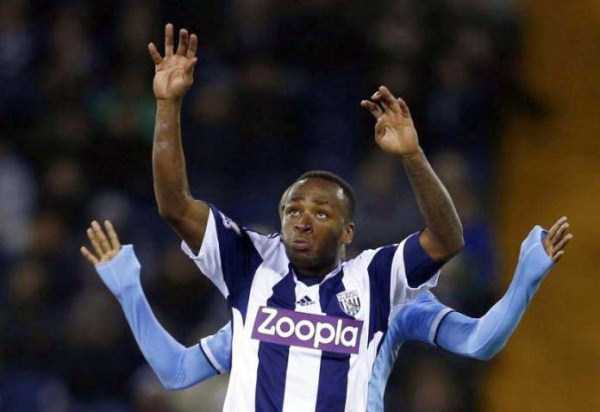 This photo can go straight into the optical illusion department. 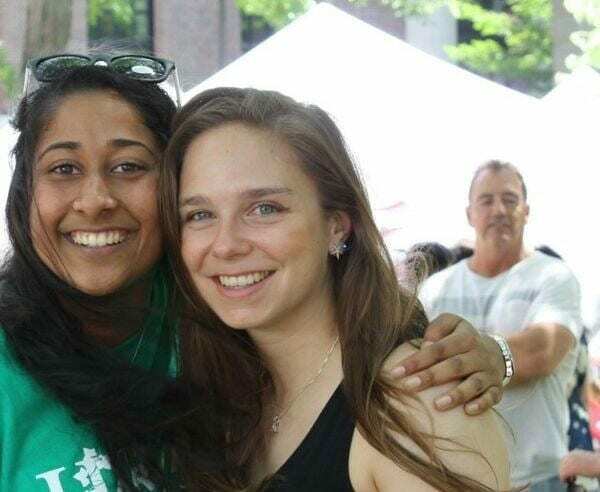 Maybe it will take you a minute to see it, but this guy’s hand is not actually that long… it only looks like the guy’s arm in the back stretches all the way to touch this girl’s shoulder, when it is really just her friend that is putting her arm around her shoulder. Simple and perfect. This picture was taken at one of Brazil’s most famous landmarks, the statue of Jesus in Rio de Janeiro (Christ the Redeemer). We’re not sure if this was the pilot original intention, but whatever he was thinking, the result came out flawless. The imitation of the statue is just so perfectly timed, it makes you wish you were there to see it with your own eyes. It’s life imitating art in the best possible way. We hope this poor guy’s commander won’t see this picture because he would surely get into trouble for messing up his flawlessly lined march. 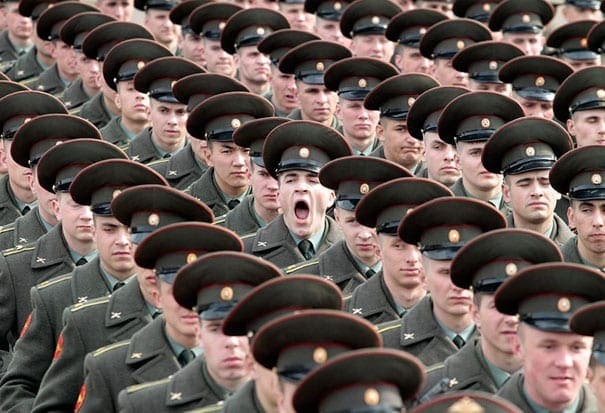 This unfortunate soldier, he must have been so tired and probably very much bored from standing in line with the rest of the group and practicing his left-right-lefts. It only took one little yawn for a quick photographer to capture those 5 seconds. We just hope he didn’t get kicked out. 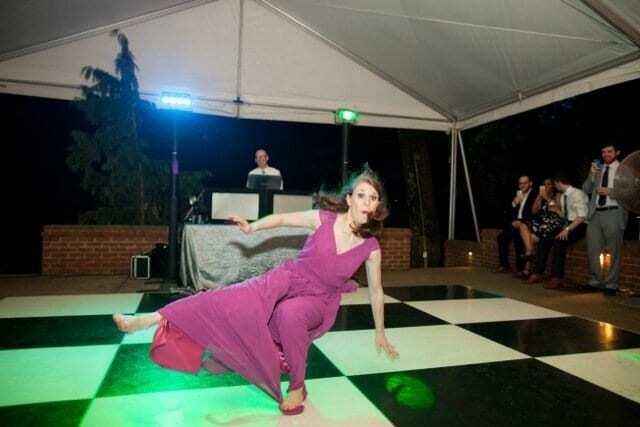 This unfortunate woman was just trying to entertain the other guests at this wedding. She gathered all the courage she could find and went on to do a little solo dance. But unfortunately, she instead just stepped on her dress which caused her to slip and have the most embarrassing moment on the dance floor. If it wasn’t at a time where everyone has their phones out all the time, it wouldn’t have been so bad. …always the bridesmaid. Well, That’s what the woman with the black hair was probably thinking about. No one wants to look desperate, but sometimes a girl’s gotta do what girl’s gotta do, and there’s nothing like catching the bride’s bouquet to fix you up. 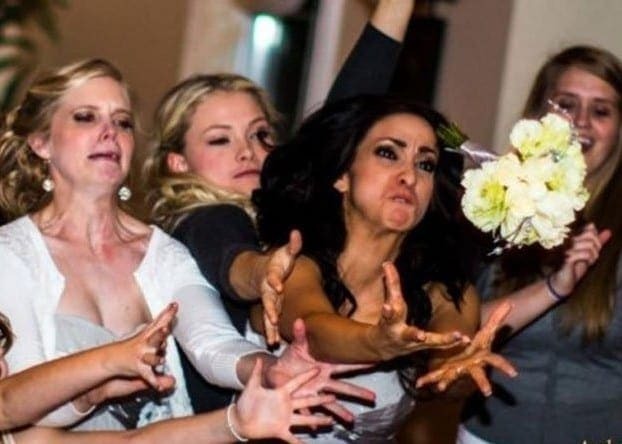 This girl was just so obsessively trying to catch the bouquet at her friend’s wedding, it looks like she knows she NEEDS it. She was so eager, it’s literally written all over her face. This bride must have said to her future husband that she wanted to do something else for their wedding day. Something really special. For example, to make a big entrance than no one would expect or make up a really cool wedding dance. 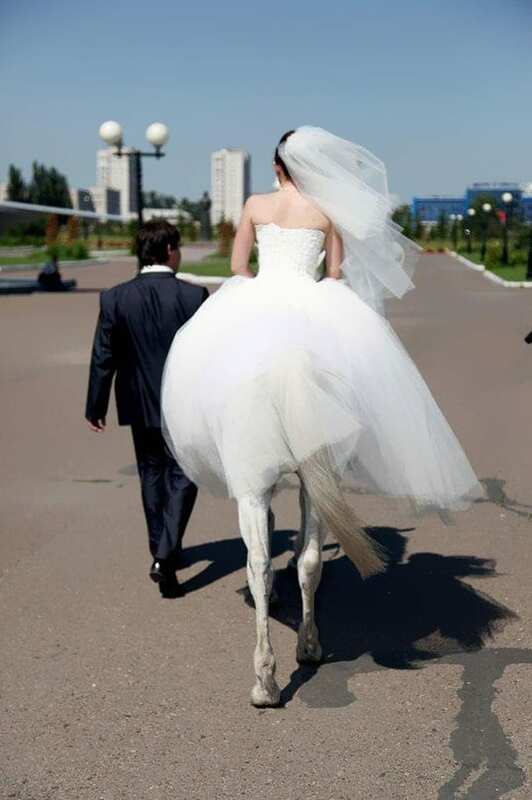 But one thing is sure, the groom most definitely didn’t imagine that she wanted to turn into a centaur! That’s definitely a way to get some attention on your big day. To start off, this picture is the definition of a perfectly timed photo. 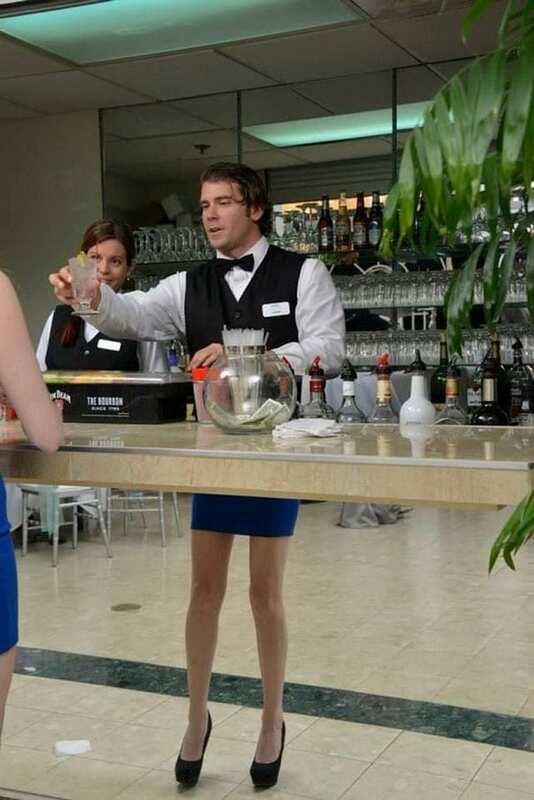 If this bartender ever had a secret dream to find out what he would look like in a short blue skirt and high heels, then now he can see for himself. Ok, so the upper body is a bit disproportionate to the lower body part, and the black and the blue don’t really mash, but still, this is just too funny. 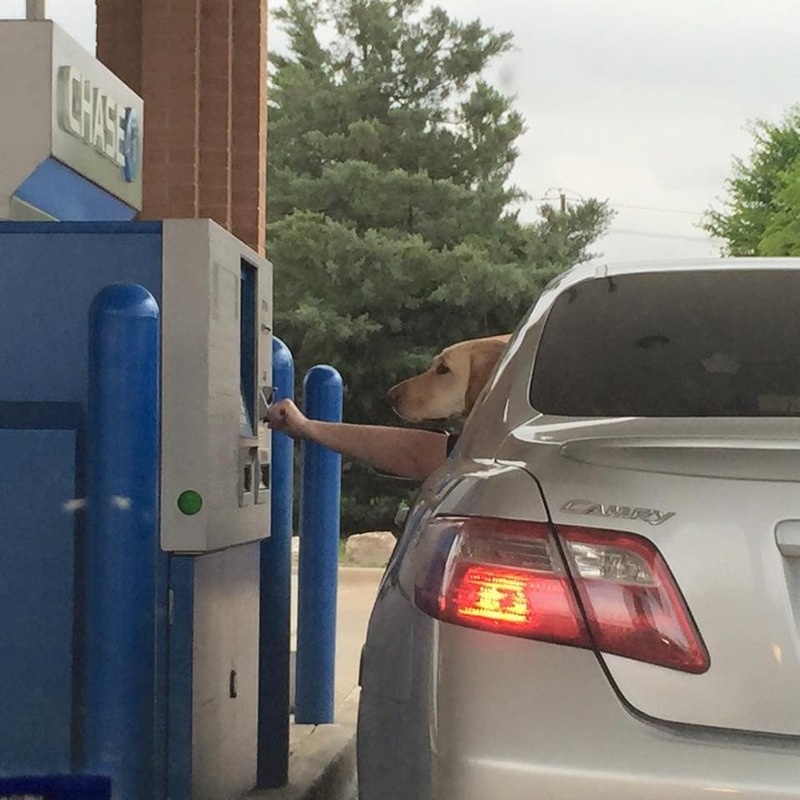 How great would it be if we could train our dogs to do all kinds of daily tasks for us like going grocery shopping or pulling out money from the ATM? 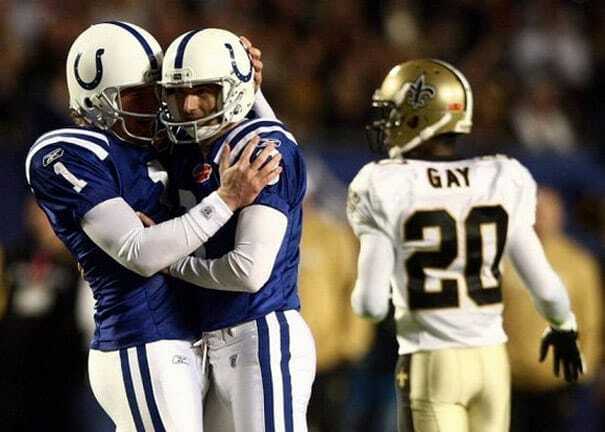 This is another great case of amazing placement being captured at the right time. They say dogs are man’s best friend, and this amazing photograph proves they are absolutely right. 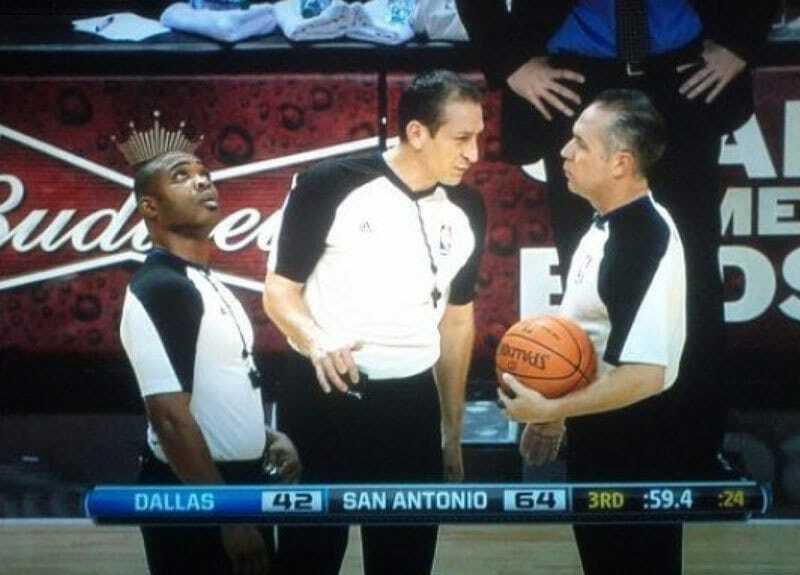 We all know that the real kings of the court are the referees themselves, they call out the rules and are the one in charge, so it’s no surprise that this referee has a crown on his head at the Dallas vs. San Antonio game. Let’s just hope he won’t make all the other jealous with that piece on his head. It might take you a few seconds to see it, but when you finally do, it’s perfect. 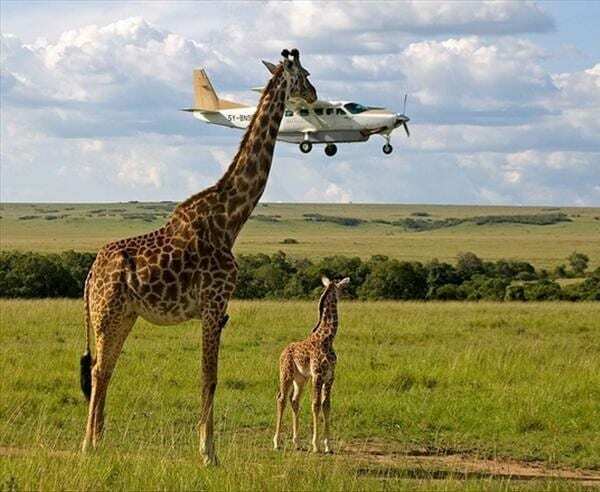 Taking a trip to the safari can be quote amusing, you get to see all kinds of wild animals, different birds breeds, great animal feedings and a giraffe catching a plane ride! Now we knew these long and impressive animals were tall, but we didn’t know just how tall they are. In case you were wondering and we know you were, an average giraffe’s height is approximately 20 feet tall. 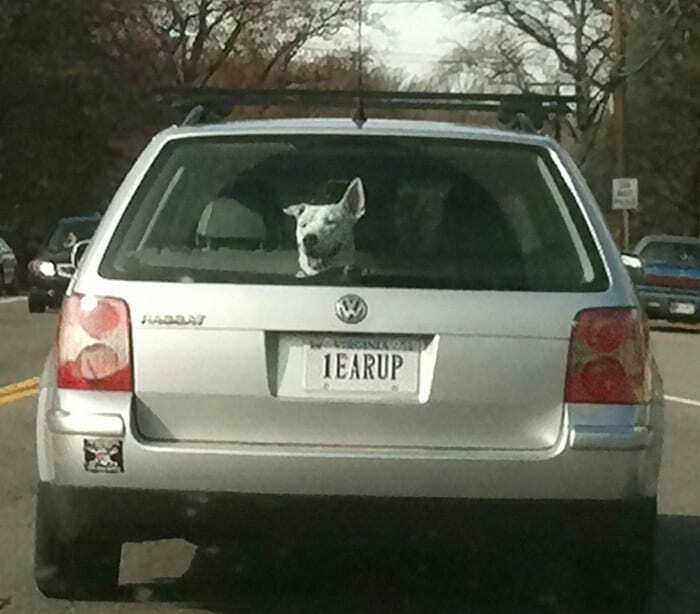 We’re not sure what was there first, the car with that funny license plate or the dog with his one ear up, maybe they got them both at the same time. In any case, this super cute dog is definitely a great source of entertainment for all those drivers out there. It does get quite boring to sit still all day and watch the sky when you can’t even get yourself to move, so you really need to get creative with the way your day is spent. 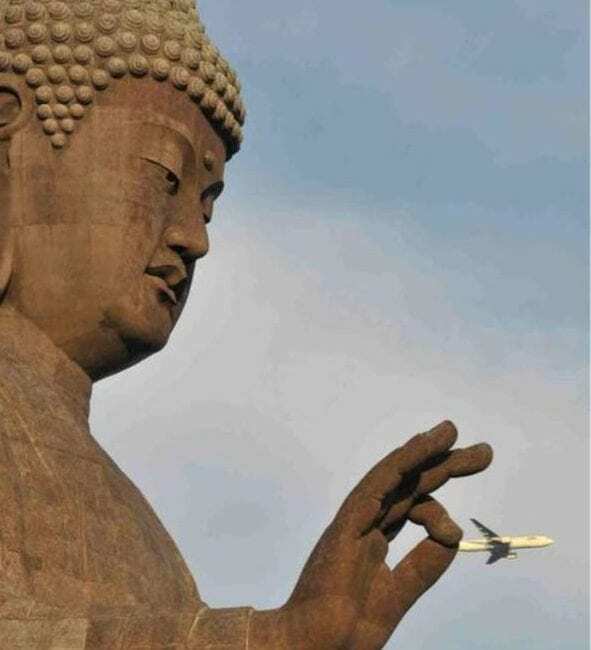 Buddah figured he could have a little fun with all those planes flying by like catching buzzing flies. They say that when you own a pet for so long, at some point they start looking more and more like you and resemble you, not just looks wise but also behavior wise. 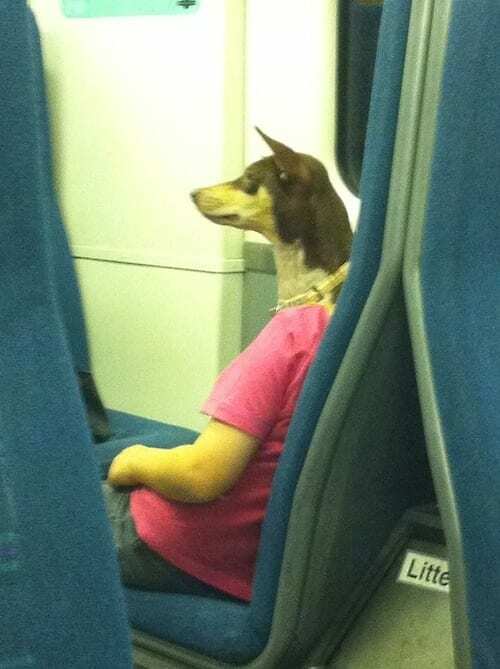 Well, this is an extreme case of a dog and his owner being combined to become the same entity! 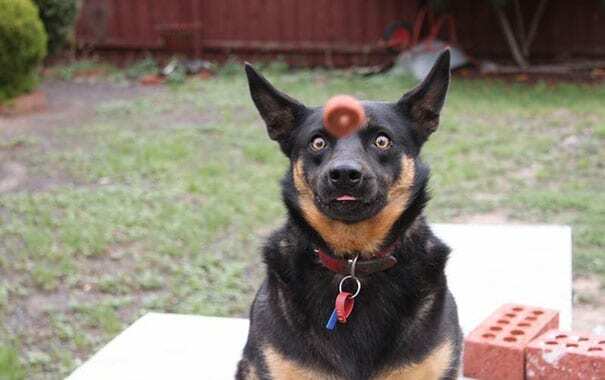 Not sure if that’s an expression of joy knowing that the treat is coming his way, or a terrified look knowing that the treat is going to hit this dog straight in the forehead. We guess we’ll never know. 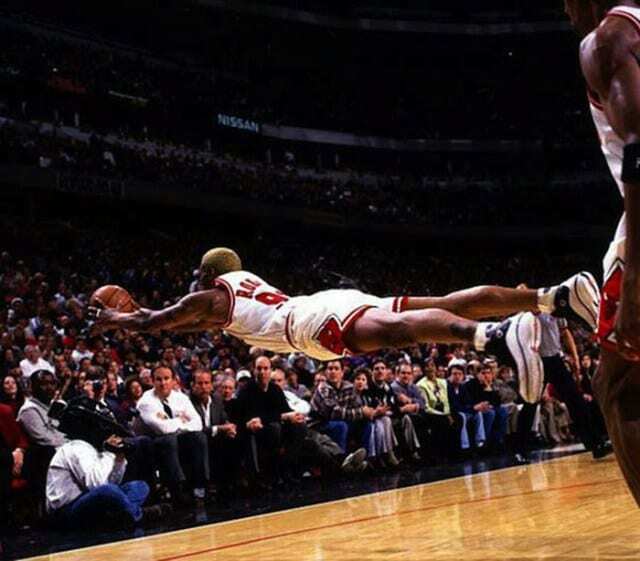 From a flying treat to a flying player, Dennis Rodman would take anything for the team, even if it means spreading his hand and flying to catch the ball. If Superman was to build a basketball team, Rodman would be the first one in. Ok so we can argue over the quality of the coffee that Starbucks offer, but as a company in order to avoid any more unnecessary bad attention, they should really be more attentive to the way they brand their different media platforms. 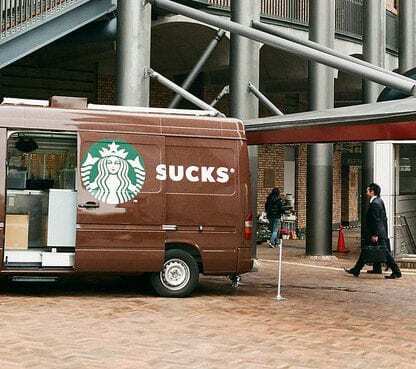 For example, someone should have seen that positioning the letters of the logo in that way on the truck’s door was a bad call. Who said you can’t do two jobs at the same time, take this football player for instance, who probably also has another job at modeling. The only problem is that he sometimes forgets which job he is supposed to be doing, because playing football and modeling are just so similar?! One thing’s for sure, he does know where the cameras are at all times. We’re not sure of this is a new type of a diving form, but if we had to name it it would call expressionism. Just look at that focused face as this diver knows she is about to hit the water like a professional. It’s hilarious. 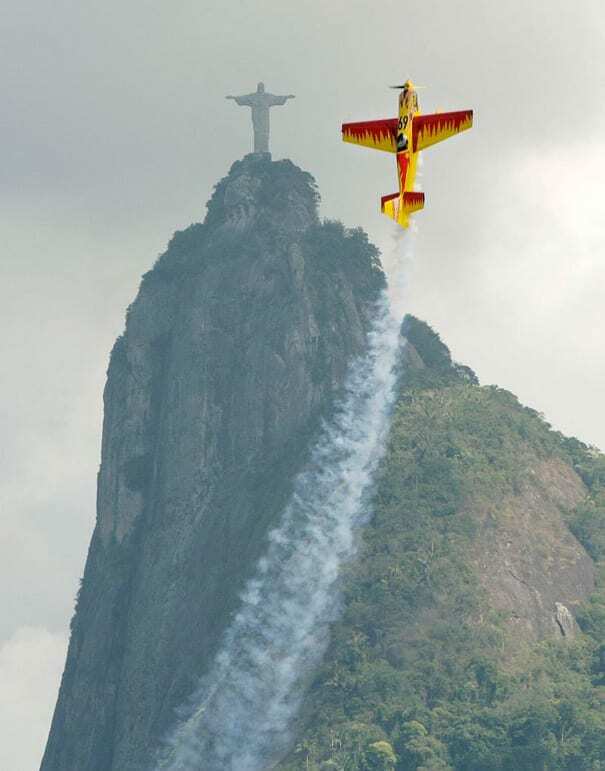 This is one of the most breathtaking perfectly timed pictures we’ve ever seen. 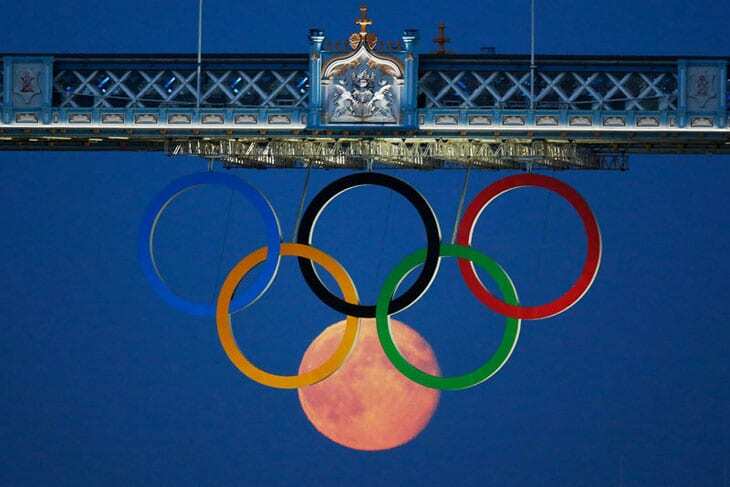 We wonder how long it took for them to hang those Olympic rings at the perfect spot to make sure that will flawlessly fit the full moon in the skies. Amazingly timed photos don’t only happen with humans and cats, they can pretty much happen everywhere, you just need someone to be there to catch the moment. Take these two trucks for example, that without any pre-planning they managed to form the one question that we all ask our selves every day – do you love your bum? 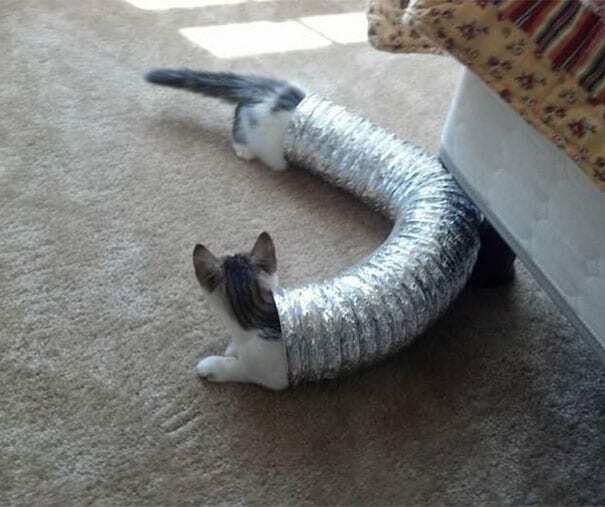 We think we’ve found the longest cat in the world! He has been hiding in this foil tube all this time, maybe he was just stuck, but we’re happy we found him. There’s no doubt that the prettiest and most spectacular pictures come from nature. 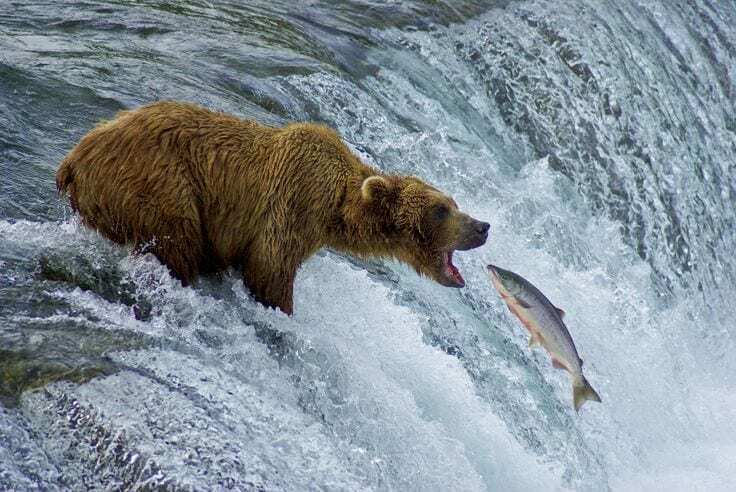 Besides the fact that this is amazing photography, just look at how the bear opens his mouth at the right time to catch the fish swimming up the stream. Just think of it as the natural food chain. 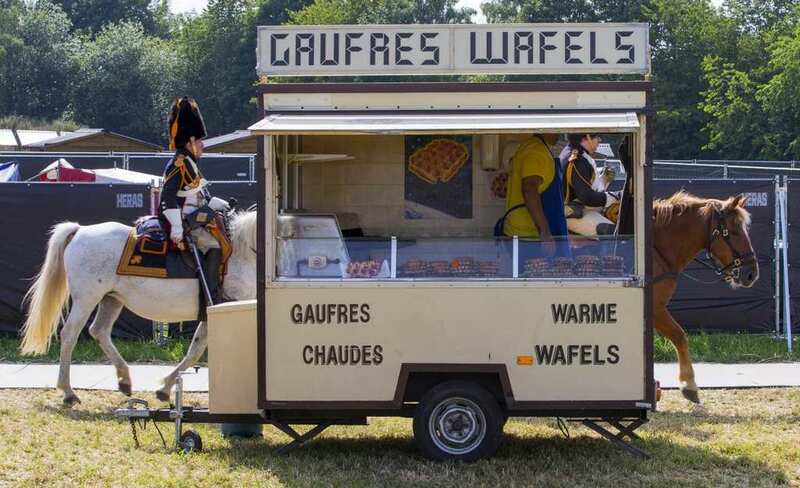 If you are too excited about the waffle truck can’t even concentrate on anything else, we’ll help you see that there are actually two horses on two ends of the food truck which makes it look like they are one long horse. Now, can we please have our waffles? That is a moment you certainly don’t see every day. 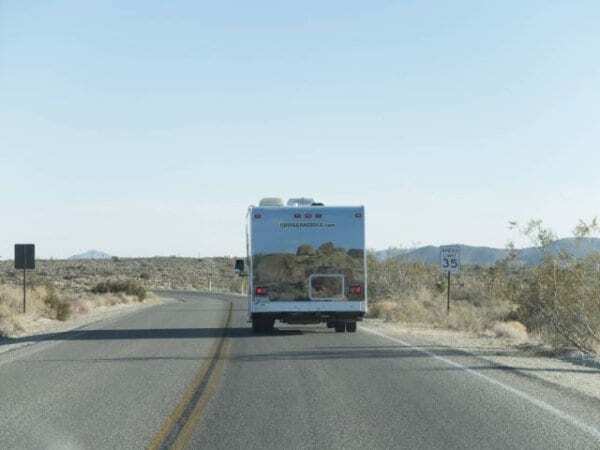 This trailer was designed in a way that it could naturally fit the environment when driving by, but the drivers probably never thought that their car would blend just perfectly with the scenery. It almost looks like some sort of camouflage, if the campers inside decide to hide if they needed to. 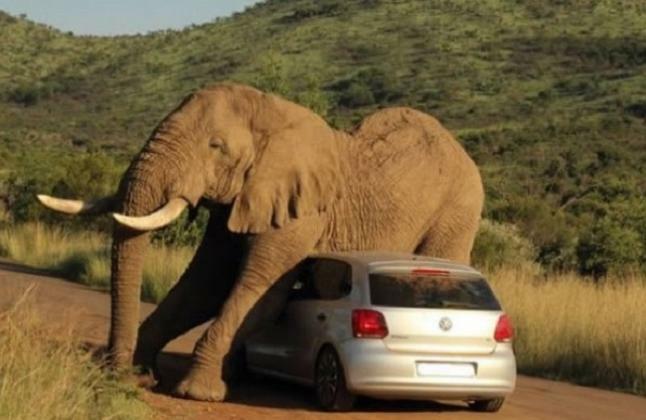 No, this is not a joke or a shot taken from a movie, this is a real elephant who just wanted to stop and strech his arms and legs, and he wasn’t going to let anyone or anything get in his way, not even a tiny car full of people. This is probably as close as you can probably get to an animal on the safari. 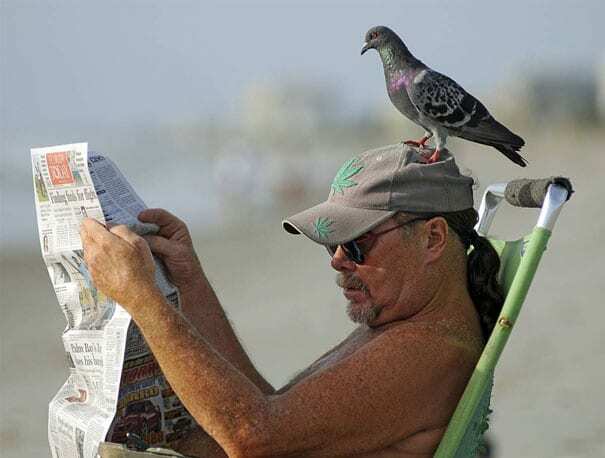 There’s nothing like spending a relaxing day at the beach, reading the paper, just you, the water and the pigeon sitting on your head. This guy seems pretty relaxed considering the fact that he has a bird resting on his hair. Perhaps he also wanted to catch up with the latest news. Sync flying is one of the hardest things to coordinate and you really need to be a professional pilot in order to nail it. 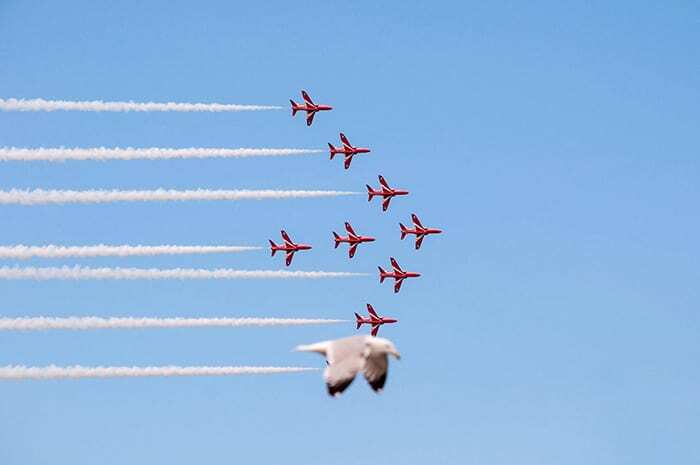 This seagull thought it would be a great idea to join the flying team and create one of the best photos in history. Another form of transportation that is just perfectly situated. Look at this composition, it almost looks like a postcard. 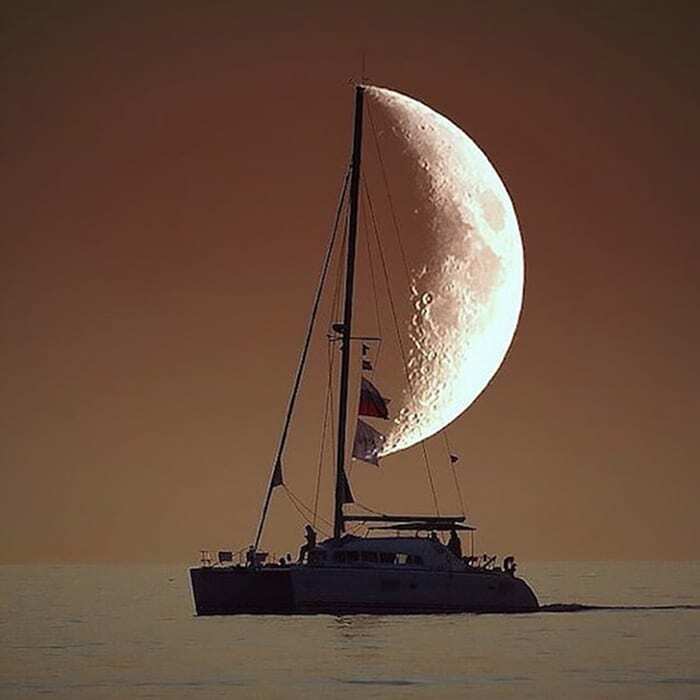 The moon serves as the sail in the picture, and we have to be honest, this makes us feel a little romantic. 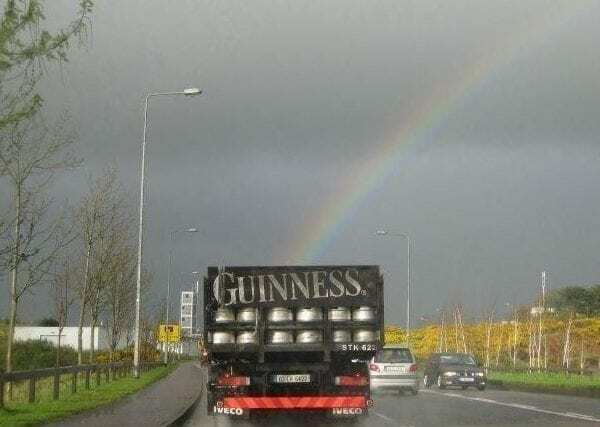 The person who drove behind that Guinness truck thought it would be a great marketing strategy to take a picture of the rainbow hitting the truck at the perfect spot. This photo is so neat, that it almost looks like a real ad for the beer company. Who said everything was so serious in the Air Force? Take these two fighter jets for instance. Their performance is spot on, it almost looks like one is staring in the mirror because they are so perfectly aligned. We think this truck got a little over itself thinking it could actually fit under the bridge. 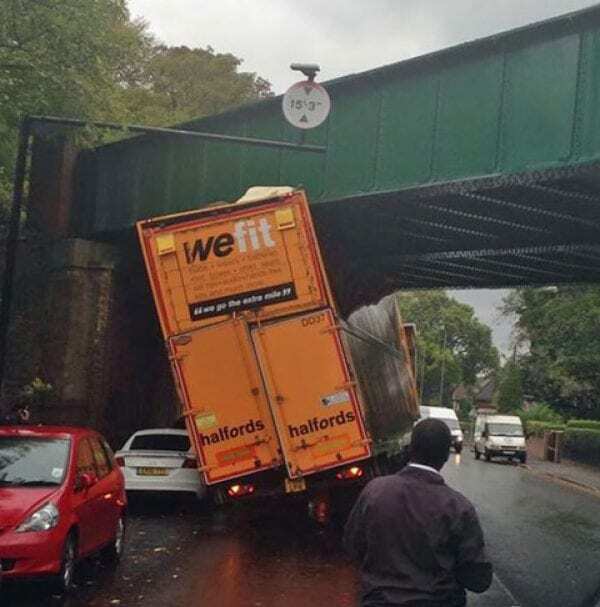 You can see that it reads ‘we fit’ at the back of it, and we think this is a bit ironic and hilarious at the same time. 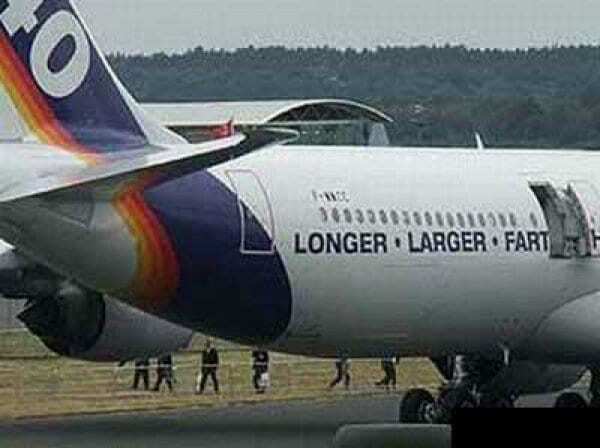 It really only takes a little bit of planning on the airline’s part when designing their plane’s body and what it will read. They should have moved the door just a little bit more to the right, and that way could have avoided the plane reading ‘fart’ when the doors open. It is pretty funny though. Under the sea you can find some of the greatest wonders that nature has to offer. 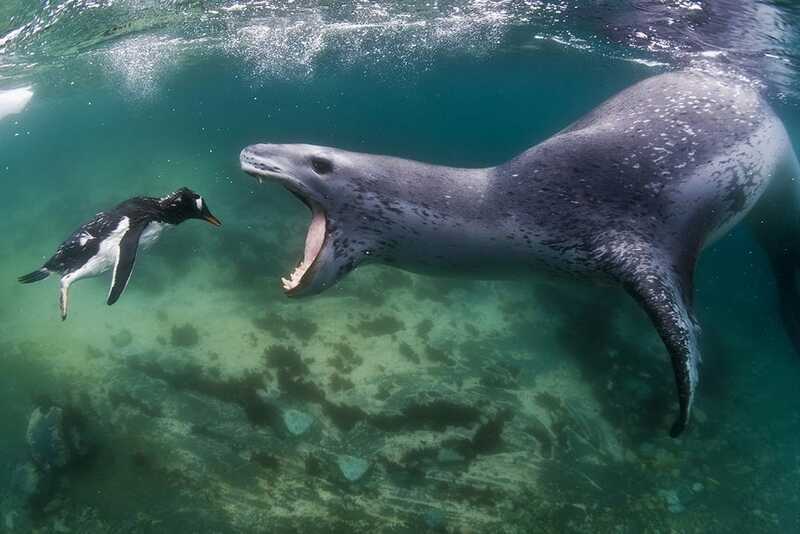 If we ignore the fact that this seal is going to eat that poor penguin, we can really appreciate the survival skills of these underwater creatures and how pretty it looks if it is being captured at the right moment. Sometimes with these perfectly timed photos it’s all a result of optical illusion or shadow playing. 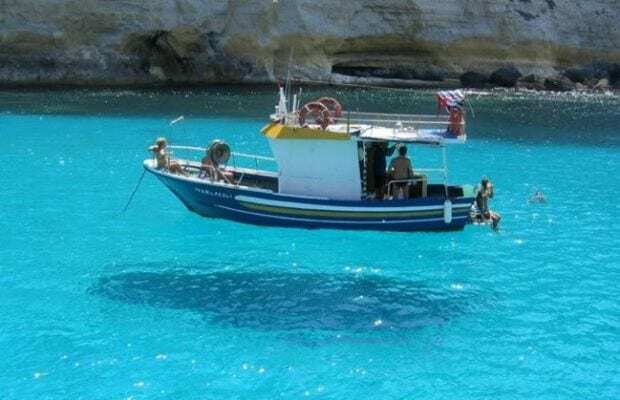 This boat looks like it is floating in the air, when in fact it’s just resting on the water and another flying object that just happened to fly above it creates a shadow which makes the boat seem like it’s up in the air. Kudos to whoever caught this on camera. This picture is adorable it almost looks staged, but it’s not! 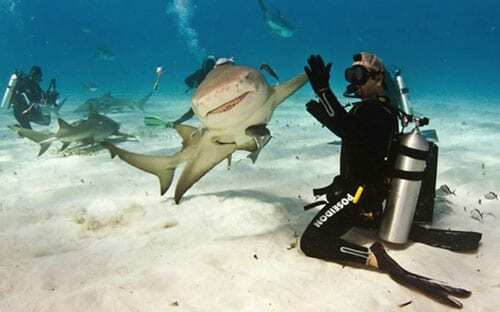 When this scuba diver dived in, he probably never thought he would get a high five from a passing shark. Now that’s a moment he will never forget. You put your right hand in, you put your left arm out’ and the song goes on and on. This is probably the song that was playing in these two soccer players’ head when they were playing. Maybe it’s another way to get them more concentrated in the game. Do you know those pictures that are taken moments before tragedy strikes? Well, this is not one of those, this is a picture taken after something bad happened. 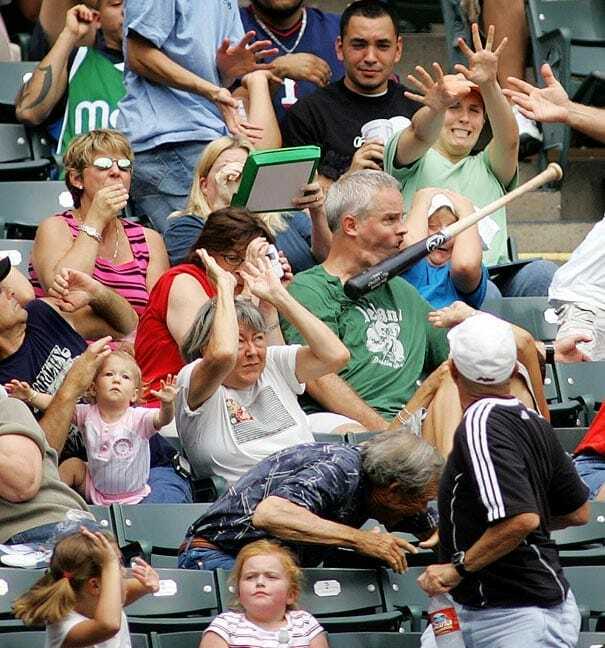 This baseball bat flew straight to the stands, and only one poor man had to take it for the crowd. Ouch. We trying to wrap our head around this picture (get it? ), and figure out what’s wrong with it. It must have been a very windy day to get the helmet fly off so brutally to the point that the player had his head pushed inside his jersey, and his helmet banged the other player’s helmet in the air. 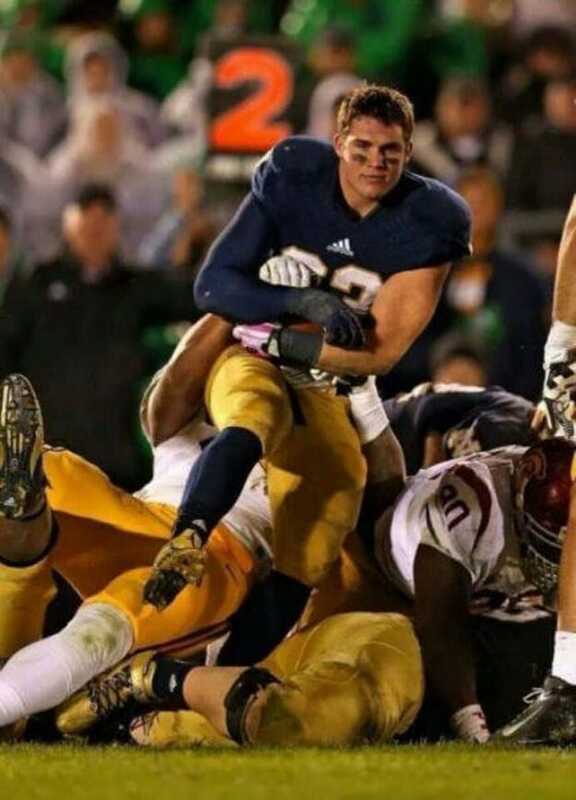 A perfect sport moment. 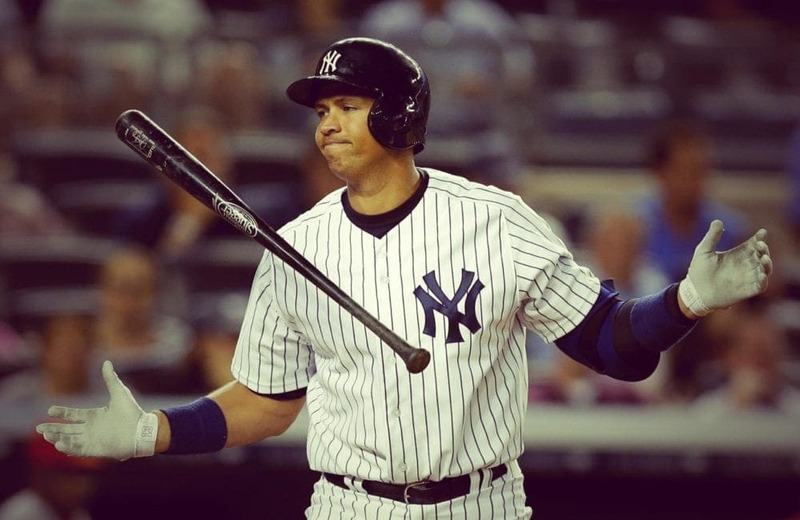 A-Rod was trying his best not to show his disappointment from whatever was going on during that game, but he just couldn’t help not throwing his bat in the air. What we got is a perfectly pictured moment with one of the best players in the world. These days, we all have them. You buy a train ticket, you get on the train and you run into a man-dog sitting in the chair in front of you. Don’t say that never happened to you. 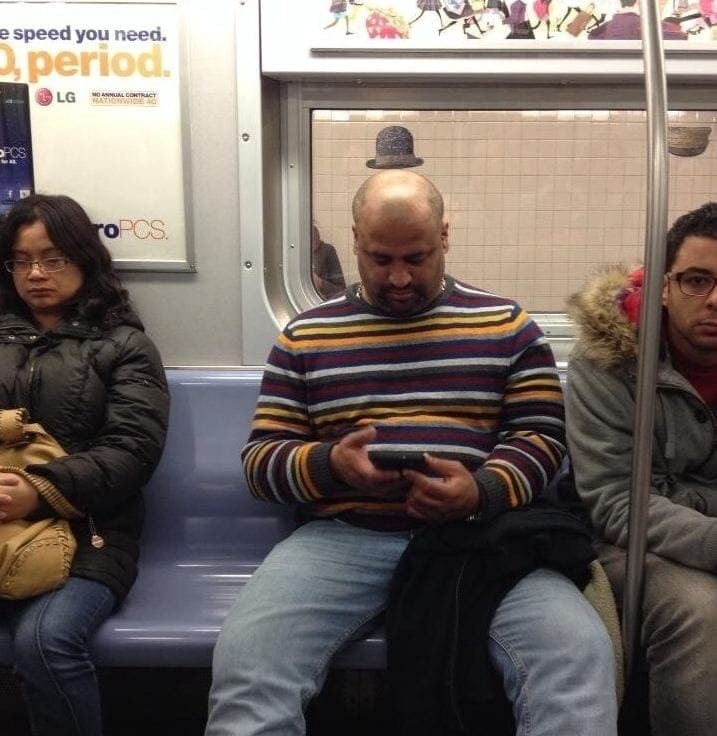 The person in the striped sweater had no clue that his fairly large head was placed in the perfect spot when the train stopped for the hat on the wall to seem like it’s resting on his bold head. A little disproportionate, but still very funny. 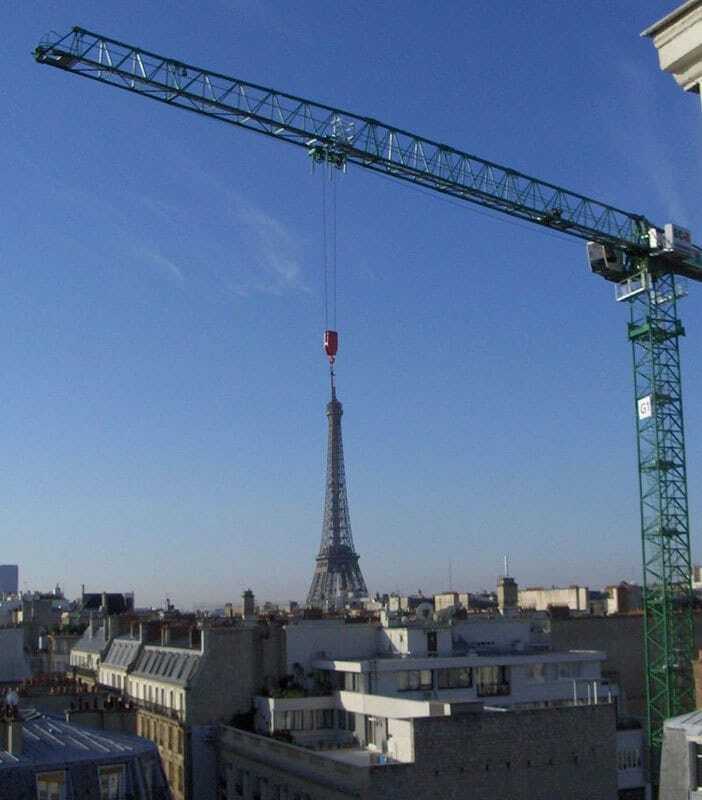 Being a construction worker is a probably much more romantic job than you may think. 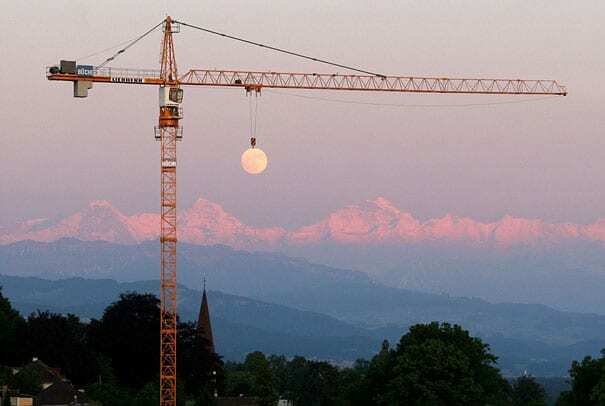 Just take a look at this beautiful photo where the moon looks like it’s hanged from the construction crane. What a sight. 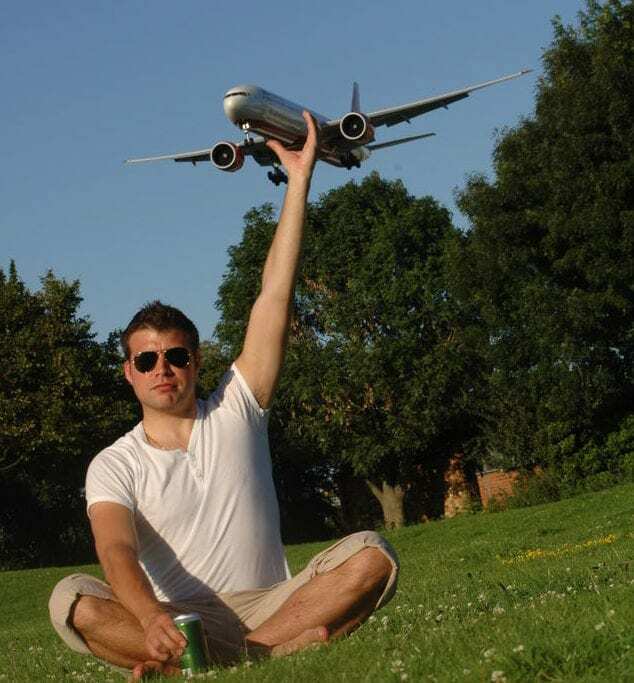 We can’t stop wondering how this guy, who was just having a nice sunny day at the park, knew when to raise his hand so it would look like he catches the plane flying over him with just one hand. Good timing dude. 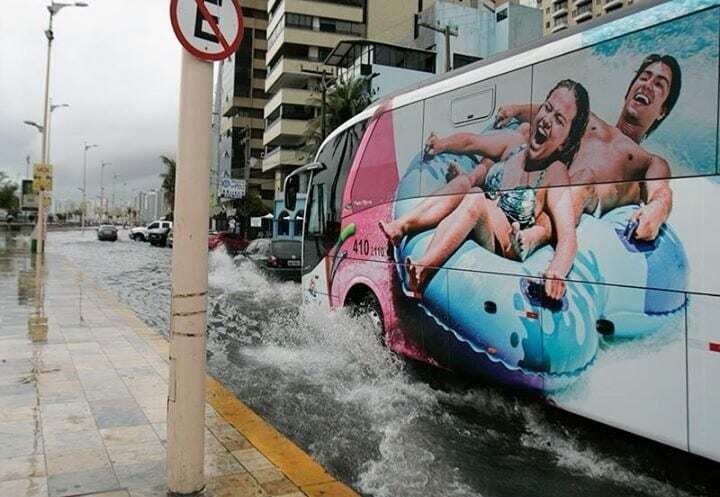 The advertisers of this water park couldn’t have asked for more when it comes to really bringing their ad to life. These two seem to have a lot of fun in this huge puddle in the city. We have a suggestion for these two soccer players who look absolutely mortified on the field: make sure you face your fears of a ball coming your way before you decide to turn into a career in soccer. Just look at their faces! As dog owners, we know that many people give their dogs leftover foods and feed them with human food as a way to treat their best four-legged friends. But we didn’t think a dog would know how to chew on gum! 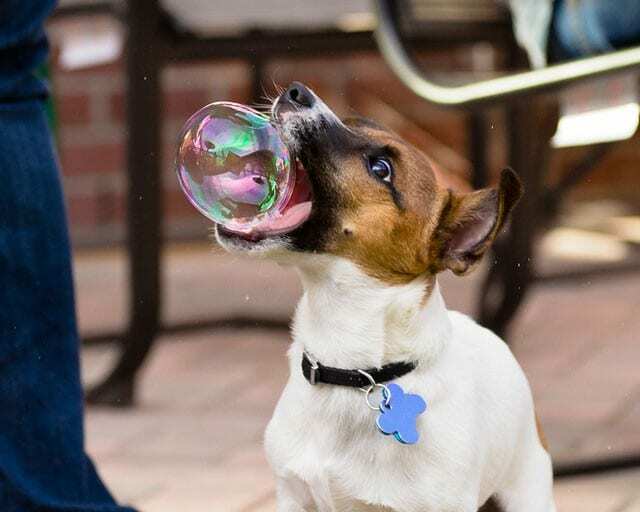 This adorable pooch seems to be having so much fun chewing on his bubbly treat. These bikers couldn’t have been more supportive of their fellow biker. Even when he has to go in the middle of a ride, they have his back, literally. Now that’s what we call multitasking! 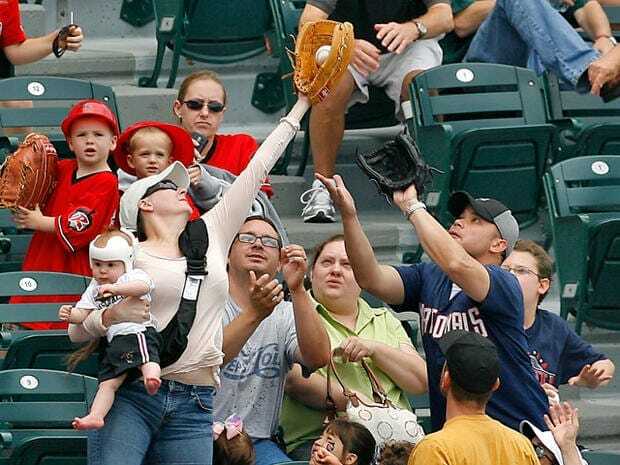 When you’re a mom, you really have o choice but to do 100 million things at the same time, even if it means holding your baby in one arm and catching a foul ball with the other. Super mom! We didn’t think wrestling can get so romantic. These two were surly caught in a moment there when they seemed more happy in each other’s arms than eager to win the match. Lovely. don’t mess with a hungry cat! This kitten was apparently so hungry that he decided he wasn’t going to wait for his owners to feed him and he was going to stick his head in his bag of food. 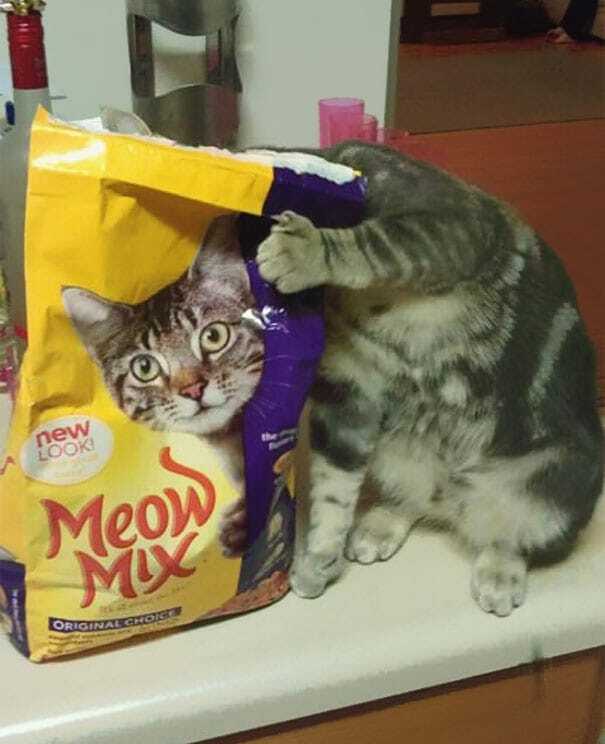 What he didn’t know was that his body blended perfectly with the picture of a cat on the bag. Spe-cat-ular! We knew that the Statue of Liberty has powerful effects, in a more spiritual sense, but this is just too incredible. This picture is seriously one perfectly timed one with the way the lighting looks like it’s coming out of the lady’s torch. Wow. 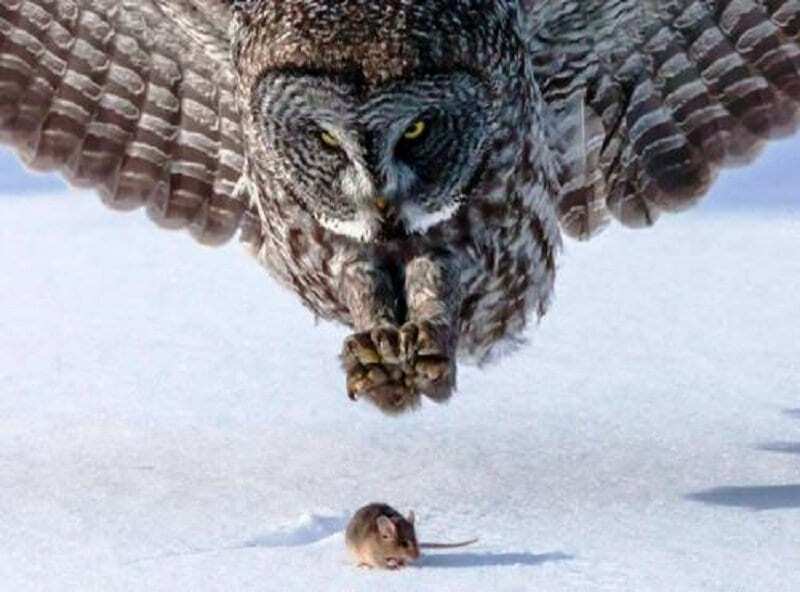 This owl knows exactly what he wants and he won’t take his eyes off of the mouse until he gets his meal. Capturing this owl in action is one rear moment to catch. Thankfully we don’t get to see what happens next. What do you do when you have all of this love and excitement to share and you have no one around to share it with? You hug the closest thing to you, both physically and professionally. This goaly does seem a little too excited though. Did Abercrombie and Fitch just start hiring furry models for their next spring campaign? 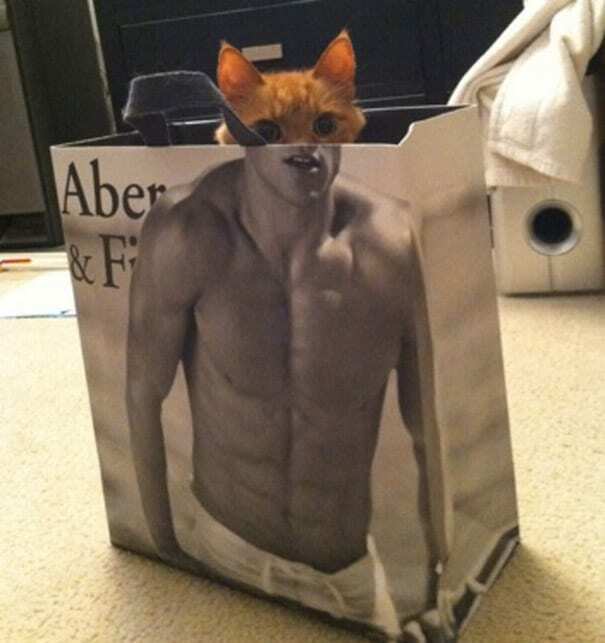 This sweet cat must have wanted to have a six-pack like all those A&B studs that he jumped into the bag to see how he would look like all toned up. We better make a trip to the most romantic city in the world sooner than we thought because the most iconic sightseeing in the city is apparently being moved, or at least it looks like it is. Ladies, please don’t make the stereotype that a ‘girl can’t catch a ball’ any worse, and just prove everyone what you can do! 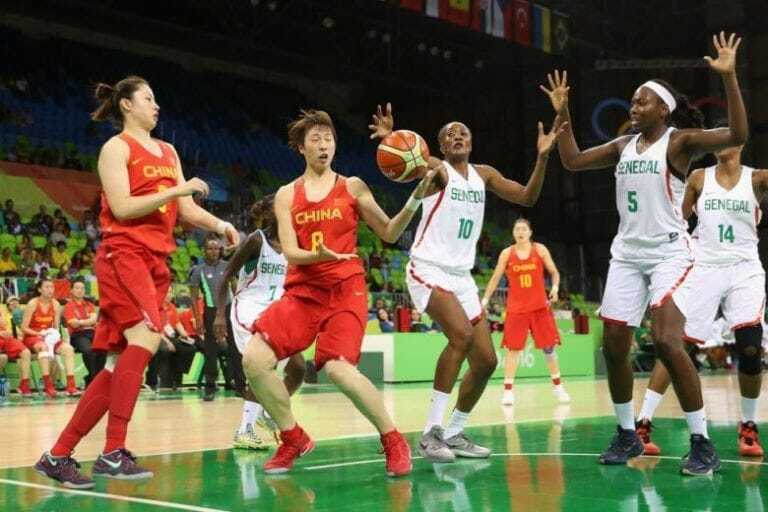 Maybe they were just being very sensitive to one another and courteous, to let the other catch the ball instead. 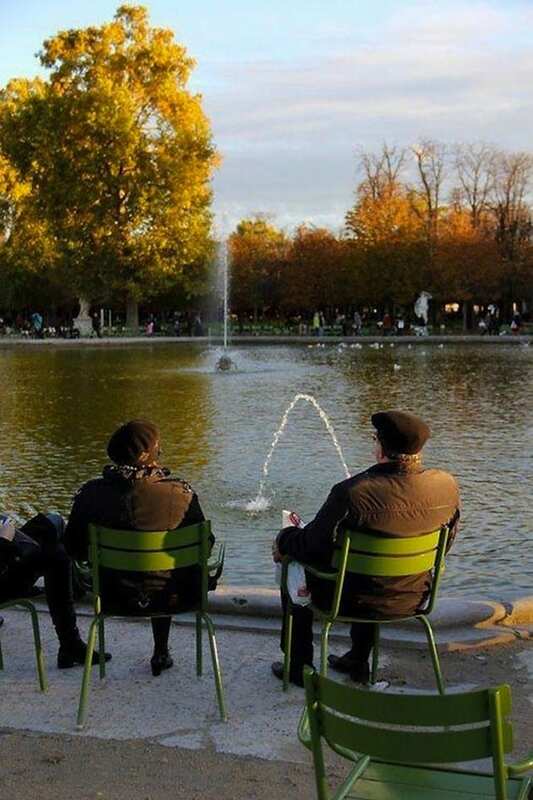 It must have been very awkward for the people passing by to watch the man sitting by the lake watching the birds and pretty much taking a wee wee in front of everyone. Oh wait, that’s just the water fountain! That’s not only a perfectly timed picture, it’s really just a perfect picture. 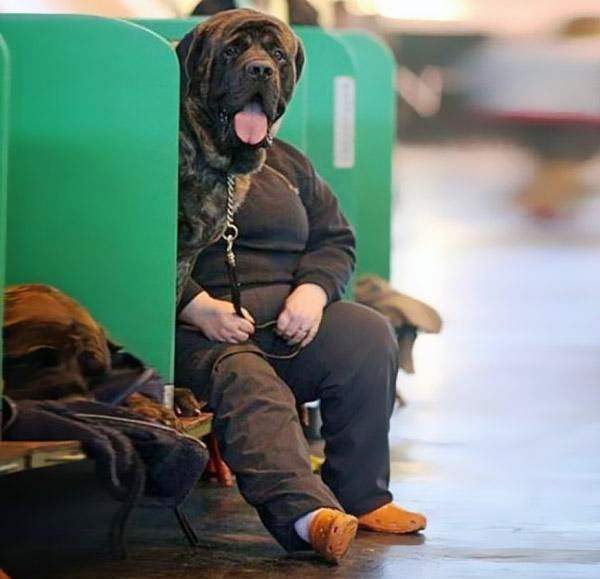 Even if it took forever for this dog owner to capture that moment and know where to place his dog so it would turn out so great, it’s still pretty awesome. Can you guess which of these two is actually fishing? 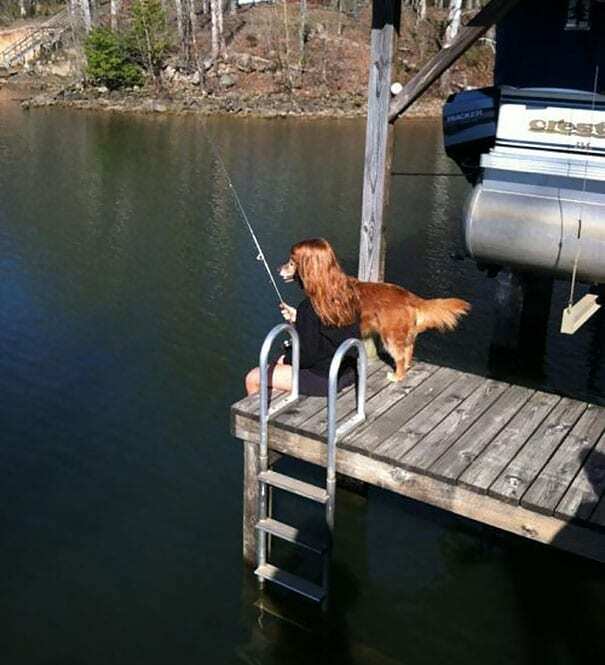 is it the ginger dog trying to catch his prey or his red-haired owner trying to fish her next dinner? Or is it the same person? wait, we’re confused. 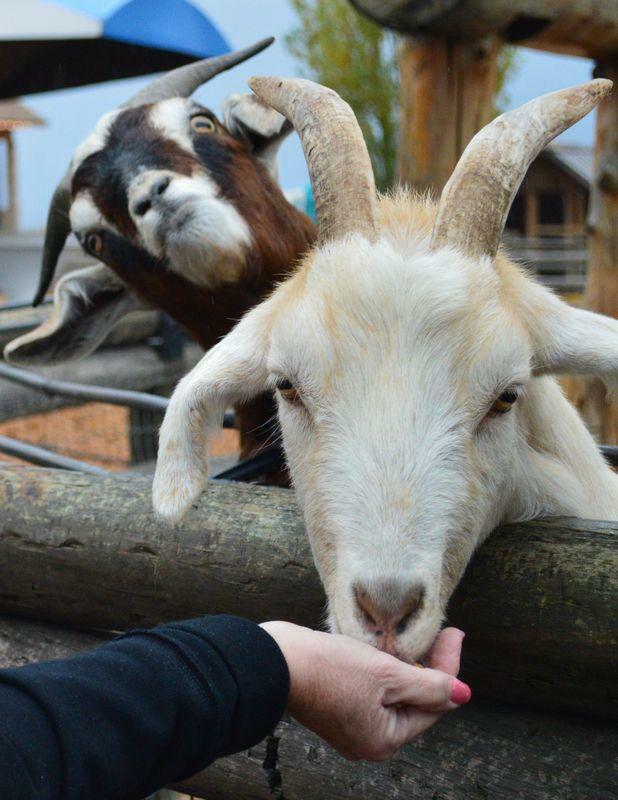 Now that’s real animal love. 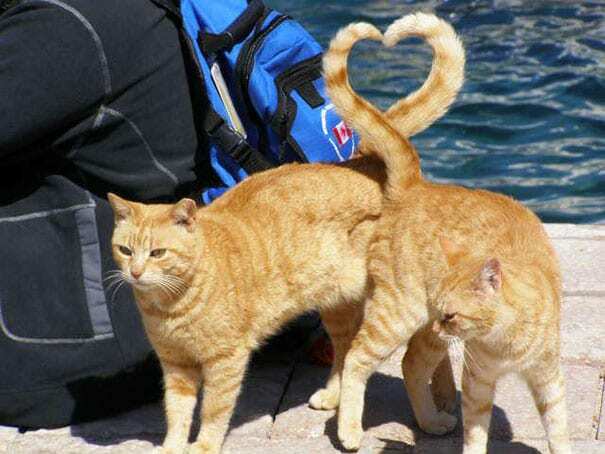 Could these two kitties be so smart that they actually staged their poses so their tales could form a shape of a heart? In any case, it’s just lovely. 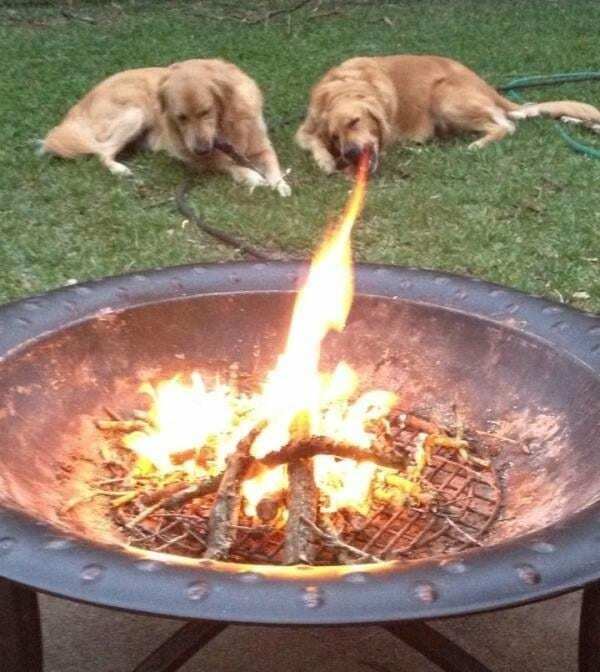 When you take your furry friends out camping with you, some pretty magical things could happen, like your dog could start spitting fire out of his mouth. These two labs are so cute that they were enough on their own to make it on our list. 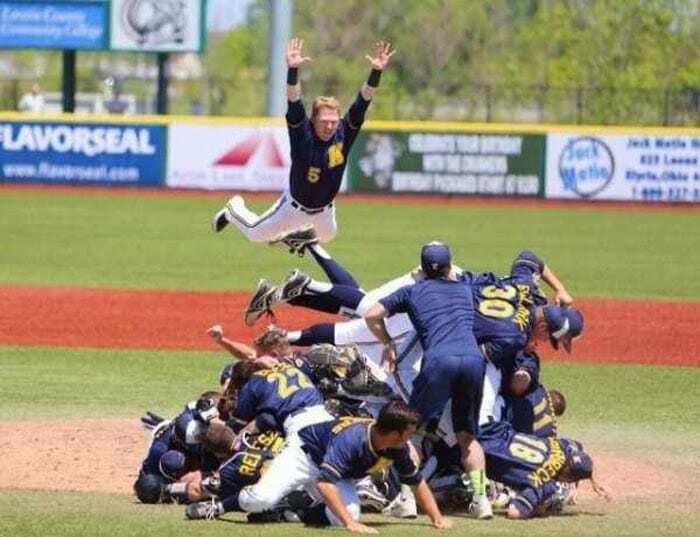 What a way to wrap up a game if baseball! Number five there was so eager to share his excitement that he literally jumped on top of that pile hoping for the best. We do kind of wish we saw what happened after he jumped though. This image is just pure perfection. This picture shows the real essence of perfectly timed photos. 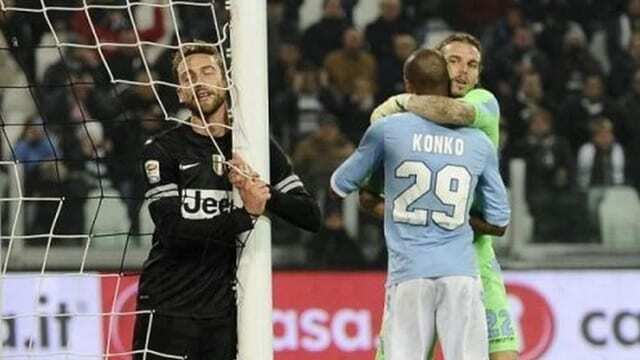 These two players seem a little bit too close for two men who consider themselves straight, and so to have number 20 there in the background pretty much telling the situation as it is, is simply priceless. We are very open minded about all kinds of loves and this is just another form of showing affection. 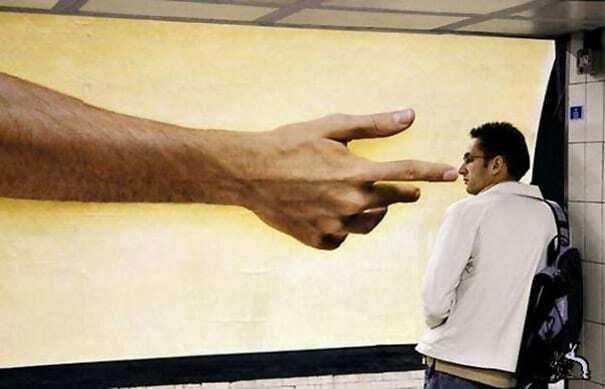 The advertisers of this billboard have done an amazing job with placing the ad in a position that it would seem like the giant finger in the ad is picking someone’s nose. Unfortunately for him, someone was quick enough to capture that! The good new is that this man’s nose will probably never scratch again.